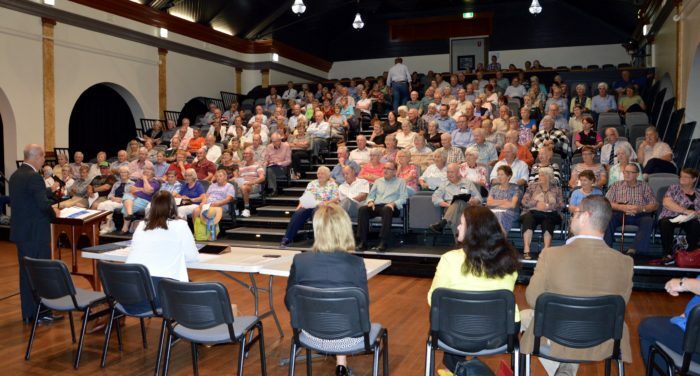 A large crowd attended last night’s public meeting on the $30 million redevelopment of Inverell District Hospital. Mr Marshall said the meeting was to keep Inverell and district residents up to date and involved in the planning process and it was gratifying to know the community was as equally interested in ensuring the once-in-a-generation redevelopment met their current and future health needs. The two-hour meeting was opened by Mr Marshall before briefings from NSW Parliamentary Secretary for Rural and Regional Health Sarah Mitchell MLC, Hunter New England Health (HNEH) Chief Executive Michael DiRienzo. “I was thrilled but not at all surprised by the strong turnout,” Mr Marshall said. “It’s indicative of the passion and determination the community has had for the best part of a decade to see a major upgrade of their local hospital and health facilities and services. “This was the first opportunity the community has had to receive information about progress on the redevelopment and to ask questions and provide feedback. We were able to allow more than half the meeting for the community to have their say and I was impressed by the considered questions, ideas and thoughts that came forward. Also present on stage as part of a pnale to answer questions from the floor on local operational and technical matters were HNEH Regional Operations Director Susan Heyman and Tablelands Health Sector Manager Wendy Mulligan and Inverell Hospital Manager Hamish Yeates. “By the questions we fielded last night most people were concerned that the redeveloped hospital be able to manage the increased demand made on its services as the district’s population grows and ages,” Mr Marshall said. “Inverell’s population goes against the trend in this region and has strong growth so we need to provide new and enhanced models of care for a growing demand in services. “At present the hospital is too old to provide a modern and responsive health care system. The redevelopment will allow for additional services to be provided in a much more appropriate facility which will attract clinicians and specialists to the community. “There were quite a few helpful suggestions made in regard to building requirements which were more than welcome. The community are not only interested in their wellbeing and comfort but also that of the staff. “One of the objectives of redevelopment is to create a new modern working facility that is supported by up to date equipment and technology and highly skilled staff. Mr Marshall said that due to unforeseen circumstances, the Clinical Services Plan was not delivered by HNEH as planned but he expected it to be available for public viewing within the next few weeks. “As soon as the plan is signed off by the department I’ll be circulating to the community,” he said.